I love the message in this book- everyone has a place here, no matter what. 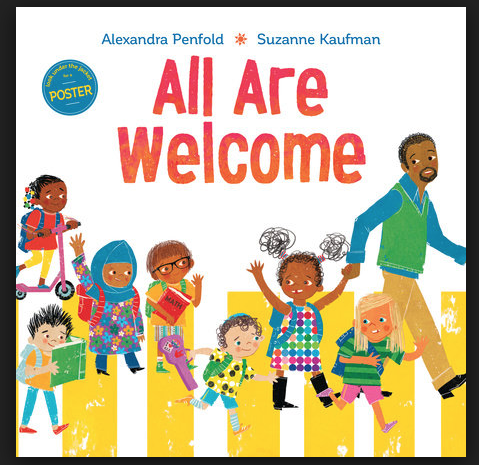 The illustrations show many different types of children and families and the whole tone of the book is very loving and accepting. This is one of my favorite stories to read at the start of Reading Workshop. At the beginning of the book, Wolf is sad, hungry and alone until he stumbles on a farm "for educated animals." 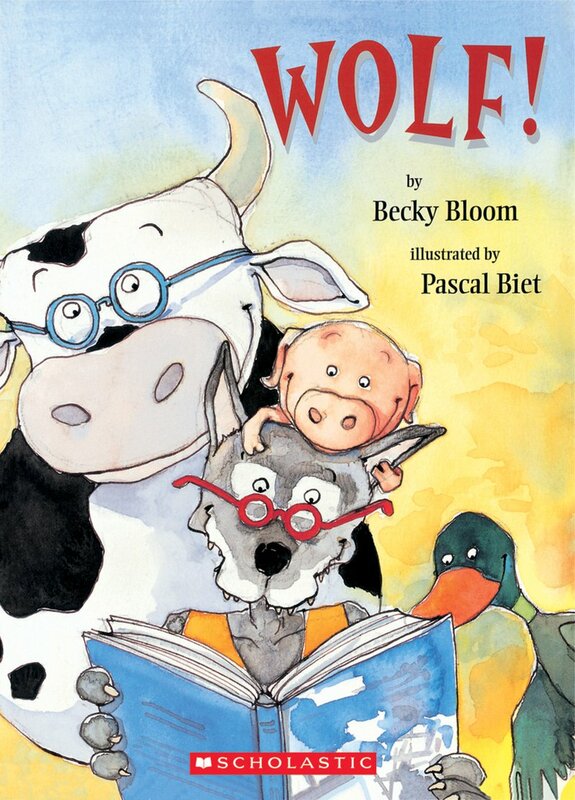 It is through learning to read and becoming part of community of readers that Wolf's life becomes more satisfying, happy and peaceful. 3. What Do You Do With a Problem? 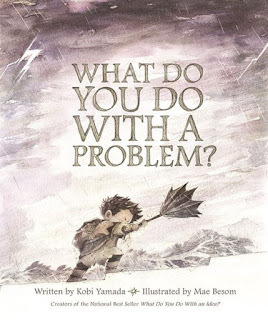 by Kobi Yamada and illustrated by Mae Besom. Every person will encounter problems in his/her life and every community will face problems together. What do we do with a problem? Hoping this book can open up conversation and discussion around ways to solve problems and keep kindness at the heart of all we do. 4. The Girl Who Never Made Mistakes by Mark Pett and Gary Rubenstein. Illustrated by Mark Pett. My son hates to make a mistake. He would rather not try then to fail at something. I think many kids feel like him and are fearful of being wrong. The safer we make it to make mistakes, and model our own mistakes, the more comfortable kids will feel taking a risk. Learning comes with a lot of mistakes! Mistakes are part of the process of learning and growing. 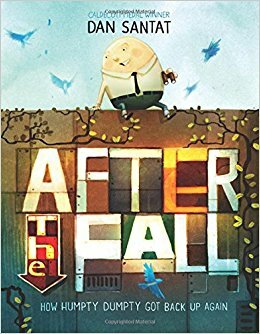 This book is a must-read as we form our classroom community of risk-takers and mistake-makers. #DotDay is always one of my favorite days of the year. It falls around September 15th and celebrates the idea of "making your mark." 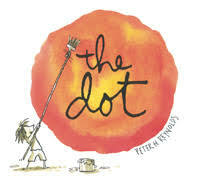 The Dot is another book that pushes kids to be more fearless and worry less about perfection. If you haven't celebrated #DotDay yet, be sure to check out the hashtag- it's such a special day! This is such a beautiful book! I plan to use this book in the early days of Writing Workshop. We can become word collectors, noticing the beautiful/interesting/precise words in the books I read aloud and the books the students read themselves. I'd like to make a display of all the words we find. 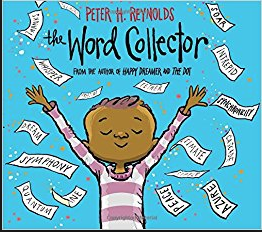 Another perfect book to share from Peter H. Reynolds! Last year, I used Thunderboy Jr. to open up the conversation about our names and where they come from. This year, I'm thinking I could create a text set based on the idea of names, including Chrysanthemum and now this moving new book, Alma and How She Got Her Name. My students write letters to their families in our Family Dialogue Journal asking about their names. Last year, some of the stories were so touching. I'm excited to share this book with my students and their families. What do you do when "All the king's horses, and all the king's men" can't put you together when? For Humpty Dumpty, his fall actually means the start of something amazing in his life. I'd love to teach my students that mistakes and setbacks are not the end, but the beginning of their journey. A friend recommended this book last year after my son went through a traumatic experience. It's an amazing book about how people talk to you after something terrible happens- the ones who want to fix everything, the ones who want to pretend nothing happened, the ones who want to hurt other people to feel better. Each of those roles is represented by an animal. 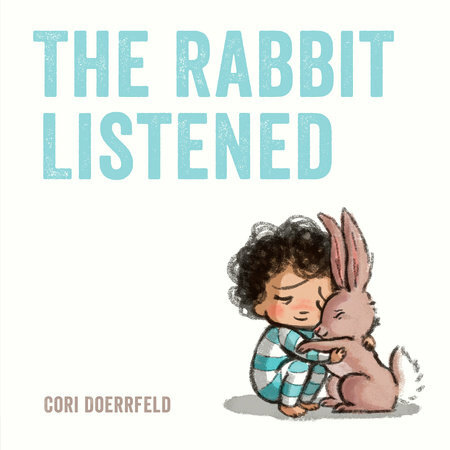 It's the rabbit who just sits with the girl, who lets her go through her own stages of grief and is there for her as a steady presence. Just listening. I think this book could open up conversations about how we help our friends when they have a problem and how to ask for what we need when we are upset. I recommend this book highly! I love every book Corey Rosen Schwartz writes! (The Ninja series is my favorite). This is a perfect book to share before any type of group work or project. It's also a book you can use to inspire at STEAM challenge! 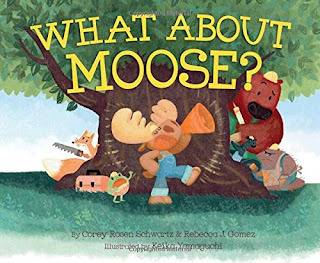 (Moose gets stuck in a treehouse after being very bossy!). I plan to read this book early in the year to help my students understand that they need to listen to each other and hear all the ideas when working together. Happy #PB10for10! Thanks Cathy and Mandy for this fun day for educators! I love every single one of your picks! These are great books for building community. What About Moose is one I have to check out. Thanks for this list! Just requested What About Moose from my public library! Love this list Kathleen. The Rabbit Listened is a new favourite for me. Recommending it to everyone! I didn't share it today, but love The Word Collector & almost shared All Are Welcome. What wonderful books on your list. 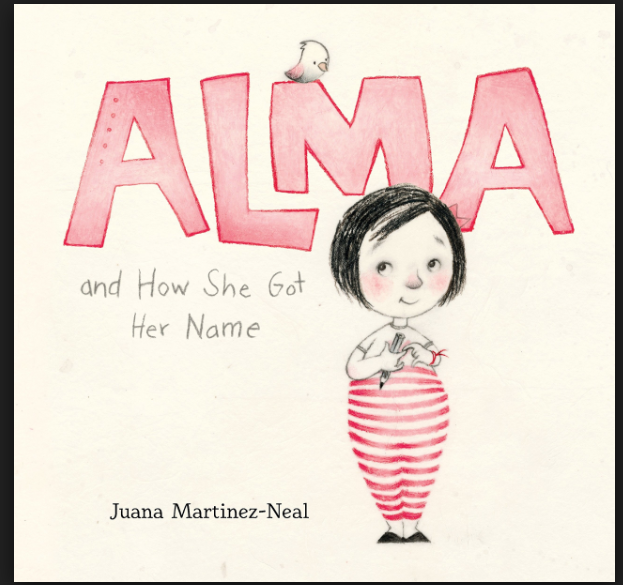 I did share Alma! Awesome list! I know lots of teachers who would love to have books to help build community and relationships. It's so important. Thanks for sharing and have a terrific year! Such a great list to kick off the school year. We don't know What About Moose? Ordering if from the library right now - Thank you! I was thinking of emailing you to ask you what you it favorite picture books are. Thanks for saving me the trouble!!! I love all of these, too! What About Moose is new to me. Can't wait to read it. So many great titles here. I especially was interested in The Rabbit Listened. Sounds fabulous. Thx.